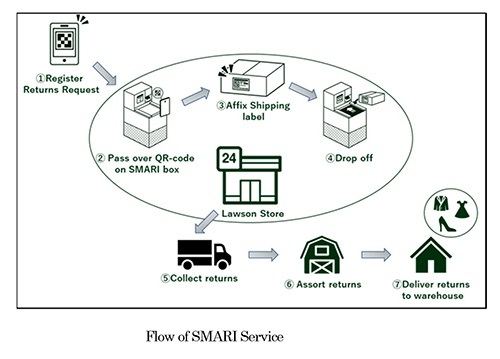 TOKYO, Mar 25, 2019 - (JCN Newswire) - On Monday, April 1, Mitsubishi Corporation and Lawson Co., Ltd. will launch "SMARI", a return service of rental products or online purchases utilizing Lawson 's existing (reverse) logistics network at select (approximately 100) Lawson stores in Tokyo. The EC market is growing every year in response to changing social dynamics, such as our aging population, declining birthrate and increase in double-income households. A positive and notable development has been the remarkable rise in returned rental products and online purchases, as more online retailers are offering additional services like rental sharing and free returns. On the downside, however, labor shortages have become a serious logistics problem. MC has been leveraging Lawson to expand its social infrastructure services, and this new one was designed and developed with the convenience store as a solution to the challenges facing Japan's home-delivery market. From its network of dedicated distribution centers, Lawson makes 7-8 deliveries per day to each of its roughly 15,000 nationwide stores. In March 2018, it launched "Lawson fresh pick," which currently services about 1,600 stores in Tokyo and Kanagawa Prefecture. The "Reverse Logistics Network Return" service takes advantage of the cargo space available in the trucks after they have made their deliveries and are on their way back to the distribution centers. 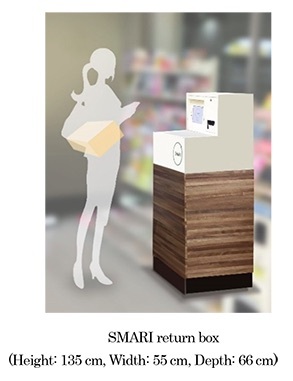 Their drivers collect rental items and returned online purchases from the SMARI "return boxes" that have been placed in the stores. This way, the returns can be made via the same logistics network and require no additional personnel. The service also eliminates the need for customers and convenience-store staff to spend time at checkouts when goods are being returned. Customers can simply drop their returns in the boxes without having to fill out return slips or wait for available cashiers. Expectations are that online retailers will continue to diversify their return methods to ensure the best possible customer service and convenience. MC and Lawson are considering expanding both their C2C e-commerce and other online services offered through "SMARI" and the number of Lawson stores where SMARI is offered. Together, we remain committed to improving customer convenience.